There are a variety of different approaches to finding a new car. Some car shoppers will first choose the type of car they want and then will compare similar makes and models. Other car shoppers will decide on a brand first and then find a vehicle within that brand's lineup that fits their needs and budget. 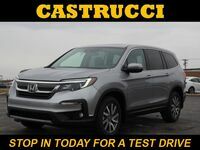 If you are more of the latter, our team at Matt Castrucci Honda highly recommends checking out Honda's lineup of vehicles. 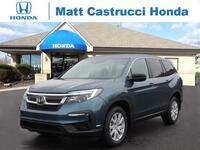 If you're looking for a new family vehicle, Honda has a few great options. If you have a growing family or need more passenger space than what's offered by a typical sedan or two-row crossover SUV, you'll want to keep an eye on the 2017 Pilot and 2017 Odyssey. Read on to learn about both vehicles! 280 hp; 262 lb.-ft. Base Engine Performance 248 hp; 250 lb.-ft.
83.9 cu. ft. Maximum Cargo Volume 148.5 cu. ft.
Perhaps the biggest difference between the 2017 Pilot and 2017 Odyssey is vehicle class. The 2017 Pilot is a three-row crossover SUV while the 2017 Odyssey is a minivan. The 2017 Odyssey comes in six trim levels: LX, EX, EX-L, Ex-L Navi/RES, Touring, and Elite. Standard features for the base trim, LX, include air conditioning, power windows and door locks, cruise control, a rearview camera, a CD player, power folding side mirrors, a rear windshield wiper, and a 3.5-liter V6 engine. The 2017 Pilot comes in five trim levels: LX, EX, EX-L, Touring, and Elite. All trims come standard with a 3.5-liter V6 engine, Push Button Start, power windows and door locks, cruise control, 60/40 split-folding 3rd row bench seats, Bluteooth® capability, and MP3/auxiliary input jack, a color touchscreen display, and a rearview camera. 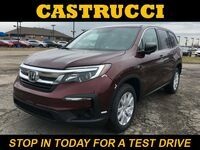 Car shoppers interested in learning more about the differences between the 2017 Honda Pilot and 2017 Honda Odyssey are encouraged to contact a member of our team at Matt Castrucci Honda or stop in and see us at our location in Dayton. We'll help you determine which vehicle is the right fit for you, and we'll even get you behind the wheel, obligation-free!